Celebrate the full kitchens free treats and handy I-65 location at the non-smoking Homewood Suites by Hilton Mobile I-65/Airport Blvd. 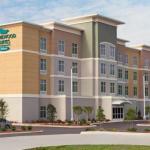 Full kitchens 42-inch LED TVs and free Wi-Fi adorn all 99 rooms at this four-story Homewood Suites. Breakfast and cocktails (during select weekday evenings) are part of the on-the-house perks at this hotel. There's also a 24-hour market for purchasing munchies day or night. Guests can get to work in the business center and tackle stubborn stains in the laundromat. When it's time to chill out head to the seasonal outdoor pool or work it out year-round in the fitness room. Pets are allowed for an additional fee. Homewood Suites is situated off I-65 within seven miles of popular downtown Mobile sites including the Gulf Coast Exploreum Science Museum the cruise terminal and the Arthur R. Outlaw Convention Center. An eight-mile drive leads to the USS Alabama Battleship. Guests are also within 15 minutes of Airbus North America Engineering. Mobile Regional Airport is eight miles west.